Many of us were shocked when John Miller announced back in the summer of 2014 that he was dismantling his K&LE layout and moving to a new house. While we were encouraged with his talk of constructing a large, new building for the next version of the railroad, we knew how much work that would entail. And the lack of an operating layout would mean that he would be placed on probation with the GLA. As time went on, it appeared that the probationary period would run its course and John would be cast out of the group he helped found. Fast forward to the spring of 2016. Not only has the building been finished, but tremendous progress has been made on the new railroad. As with everything John does that's railroad related, the size and scope of the new operation is, well... large. The building measures 60' x 35' and it's clear that every inch it will be filled with railroad. So let's take a tour of what's happening on the new K&LE. First up are a couple of shots that were taken from the end of the building near the entrance. These will give you an idea of the overall size of the structure. Now let's take a look at how some of the sections of the old layout have been incorporated into the new one. The shot below shows the east end of Undercliff Yard. Those familiar with the old layout will recognize Herrick Lumber and the tracks that curved east to Fairfax. The new yard extend toward the back of the building in the left center of the picture. In the shot below, Undercliff Yard is on the right and the Eggleston Avenue switching district is on the near left. On the far left we can see a portion of Newport Steel along the wall and it extends all the way across the wall in the back of the building. All of these photos were taken during a Monday work session. As is typical for a work session, John is doing anything but working on the layout. In the photo below, he's weathering another freight car. The photo above shows the workshop that's under the SOU and L&N staging yards and a portion of Newport Steel which can be seen just to the right of John's head. The door into the building is at the far left of the picture. The photo below shows more detail of the service yard for Newport Steel that can be seen in the photo above. The back of the Eggleston Avenue switching district can be seen on the right. Oasis Yard has survived the move and can be seen in the photo below beneath the steel mill building. The switching district to the left of the main line has been modified from the previous version. And in the middle left of the photo, you can see the engine terminal at Undercliff Yard. Now we're looking down Undercliff Yard toward the garage door on the far end of the building. The Eggleston Avenue switching district is in the middle right of the photo. Turning to the left from where the photo above was taken, we can see the new route of the main line and the approach to the Ohio River bridge. Another portion of Newport Steel can be seen against the back wall. The track coming through the approach to the bridge leads to a small support yard and the switching district to the right of the main line. The photo below shows the main line heading under the approach to the Ohio River bridge and on to the west of Cincinnati. To the right of the main line is... you guessed it... another switching district. And last but not least, a shot of a train that actually ran on the day of the visit. This is the ore train headed to Newport Steel. It's incredible to see how much has been done over the past year and a half. And it's clear that this railroad is going to be every bit as much fun to operate as the last one, if not more so. The only drawback is that he's had Bill "Smokey" Doll working on the electrical connections. Bill has never met a wire that can't be soldered with a blow torch. That's probably why the underside of the benchwork looks like someone's wood burning project. Here's hoping that electrical current can actually pass through the maze of wires, connectors and smoldering benchwork. Congratulations on the progress, John- we are all anxiously awaiting the first operating session on the new K&LE! At the end of the last op session, there were a handful of trains that hadn't run. Rather than just leave them for next time, I decided to run a few of them. One of the trains was MN-68 which runs from Morgantown, WV to New Market, VA. This train has set-outs and pick-ups in North Pierce. While I had caught glimpses of this train being worked in the past, I had never brought it into the yard myself and worked it. Actually running the trains on the railroad can teach you a bit about what challenges the crews face and show what parts of the track plan design don't work. 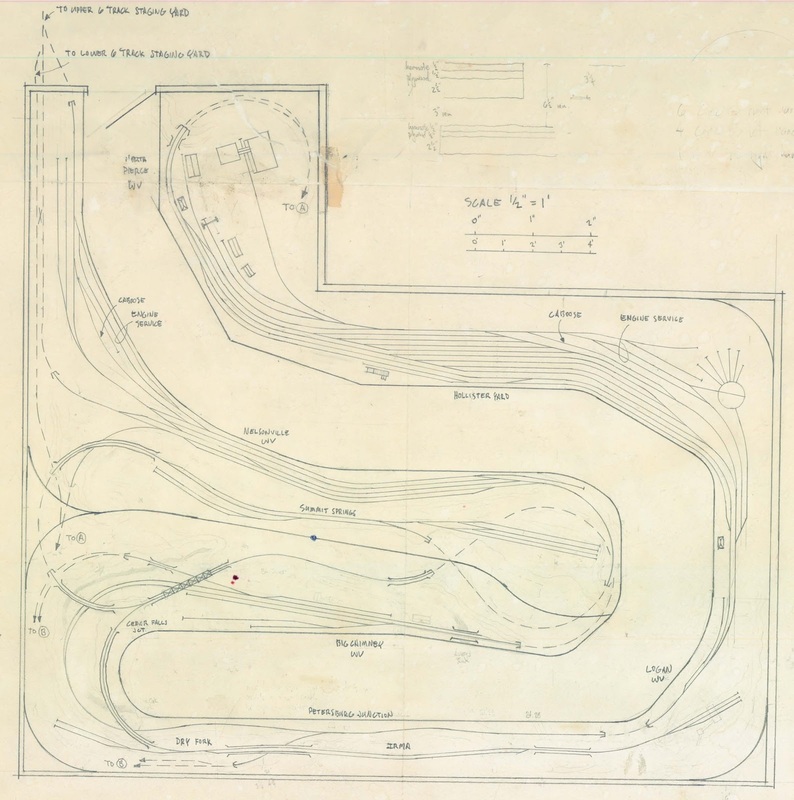 The track plan diagram below shows the layout of Hollister Yard in North Pierce. And the photo below shows a close-up of the track arrangement at Hollister Yard. The yard is really two small yards combined- a coal marshaling yard and a freight yard. The intent of the original design was to have the freight yard worked by the lead on the left and the coal yard worked from Coal 1. Any freight train that needed to be worked would come in on one of the yard tracks. And while I knew there would be locals that would handle both coal and freight, I didn't plan for how the freight and coal would be combined in the yard prior to departure and broken up upon return. As fate would have it, every yard crew to date has worked the way freights out on the main. The pick-ups are brought out onto either the main or the siding and the switcher works the train. Once the train has departed, the switcher takes the set-outs back to the yard. Looking at the track plan, you can see how far out of the yard the switcher has to travel in order to get onto the main and into the siding. Depending upon the number of pick-ups, the yard crew would have to go past the yard limits to the east. And on the west end, there's almost no room to get out onto the main without blowing through the yard limits. So why aren't the freights getting worked in the yard as originally intended? At the end of the last session, I discovered why- the yard gets too full during a session to bring a train in and work it. The yard is relatively empty at the end of each session, and I knew it could get busy there mid-session depending upon the ebb and flow of traffic, but it never occurred to me that it would be too full to work a train. And if the freights were going to be worked on the main, something had to be done to cut down on the time and effort to get cars out and back. So I proposed a solution to several of the crew members that usually work Hollister Yard. The photo below shows the result- a new crossover that's going in between the main and the yard. This crossover will provide much better access to the main from the yard and should cut down significantly on the amount of time and effort it takes to work a train on the main. 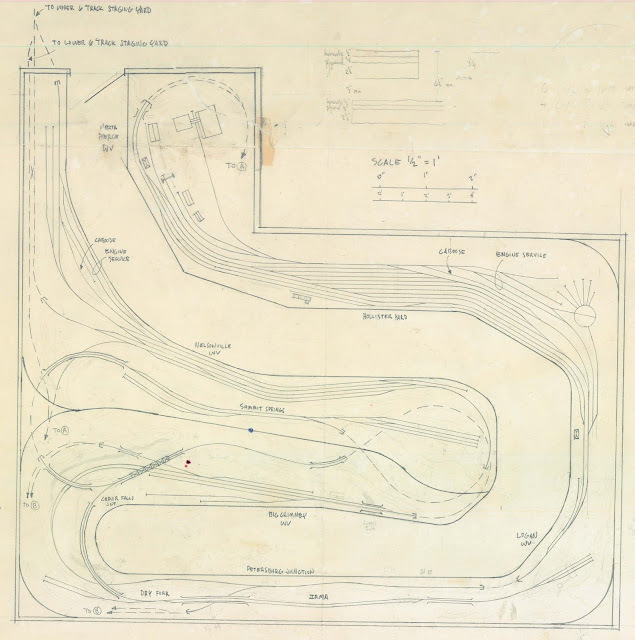 One of the crew also suggested a connection between the freight yard and the coal yard so that cars could be passed back and forth without having to run out to either end of the yard. The template in the photo above shows the proposed location of that connection. I had originally planned to located a scale here but that won't work for a number of reasons. So the turnout off Coal 1 (where the GP38's are sitting) will connect with Freight 4 just below the fuel tank of 2013. And in order to provide as much flexibility as possible to the yard crews, another crossover will connect the main and the freight yard on the east end. The photo below shows where this connection will be made.